The Full Color Plastic Badge reproduces a clear crisp imprint of your logo on a glossy white plastic. Thickness is 90mil (3x thickness of a credit card). Using digital full color process they are produced without a setup charge. No personalization (for personalization, please refer to #NT-58). Works great with your own adhesive label or just a sharpie marker. Absolute mininum is 10pcs. Production Time is 3-5 business days (please call for 1 day rush service). Price below includes a standard pin back. Additional fee for magnet backing. The Full Color Plastic Badge reproduces a clear crisp imprint of your logo on a glossy white plastic. Thickness is 90mil (3x thickness of a credit card). Using digital full color process they are produced without a setup charge even at small quantities. Includes two lines of personalization and a standard pin back. If you just need to have your logo printed and no personalization please refer to our item NT-55. Production Time is 3-5 business days (please call for 1 day rush service). Price below includes a standard pin back. Additional fee for magnet backing. Our Silk Screened Plastic Badge offers an inexpensive way to produce your color imprint on a durable 2-ply plastic. Print logo only. No personalization available. Works great with a Brother P-touch label or sharpie marker. Includes one color imprint and a standard pin back. Production Time is 10-12 business days. Additional fee for magnet backing. Absolute minimum is 25pcs. 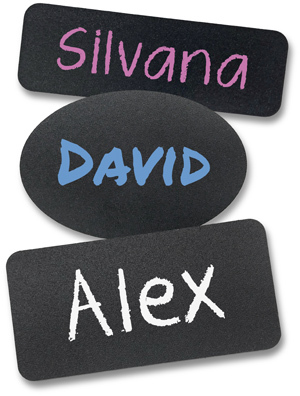 This NEW and COOL reusable chalkboard name tag allow your employees to show character and maintain a professional integrity. Easy writing with standard chalk or liquid chalk marker and easy wipe off the surface. Sold as a blank name tag. Includes a standard pin back. Magnetic and clip backings are also available with extra cost. Three sizes to choose from. Thickness is 75mil (0.075", almost 3 credit cards thickness). Very durable and long lasting. In-Stock Item. NO MINIMUM QUANTITY ORDER!